The Five Keys feature the powerful and empowering body-mind-spirit principles of the yoga system. Health in this sense of total well-being begins by acknowledging that the “being”, as in “human being”. includes aspects of the physical, mental, emotional and spiritual. Holistic health is achieved by instilling awareness and understanding of the importance of good posture, effective breathing and whole-body mobility, and a conscious connection to the life force, or spirit – the energetic fabric of the universe. These very foundations of physical well-being are affected by the mind and its scope of emotional and mental attitudes – that is why mental hygiene and spiritual consciousness are also necessary aspects of truly holistic methods. Stress release and aspects of diet and nutrition are as inseparable aspects of healing as meditation as a technique for focus and clarity of mind. Insight into and understanding of the energetic-vibrational aspects of healing is an important starting point on the long journey of holistic, integrated well-being. All five Keys are interrelated and interdependent. No one Key is exclusively ‘physical’, ‘mental’ or ‘spiritual’, and no one Key should or could truly stand on its own. However, for the sake of initial understanding, the first three (‘Posture’, ‘Breathing’ and ‘Mobility’) start from a mostly physical approach, while the last two (‘Stress Release and Relaxation’ and ‘Body, Mind and Spirit’) contain ‘less physical’ elements – they may be called the body-mind-spirit Keys. The three ‘physical’ Keys may be used effectively to improve comfort, general health, vitality and performance during ordinary activities and sport. The two body-mind-spirit Keys may also be used separately, especially by those not so interested in physical activities. However, the greatest success is met when the Five Keys are integrated, even modestly, into all aspects of the being. Each Key is briefly introduced. The Five Keys constitute the very foundations of comprehensive health care when all its elements are properly integrated. Correct posture makes effective breathing possible, exercise safer and more efficient. Exercise and nutritional well-being contribute to a positive outlook on life, but nutrition and exercise alone are not enough to combat stress. Specific techniques of awareness and stress release are necessary to recognize and cope with stress-inducing situations. Meditation bridges the gap between body, mind and spirit, bringing about the high levels of mental clarity and sensitivity necessary to gain physical mental, emotional and spiritual fulfilment. The Five Keys are vital to all aspects of personal health and health care programs. The philosophy of Five Keys does not contain exclusive knowledge, is not a luxury or an alternative therapy. Neglect of the basic building blocks of posture, breathing and mobility may result directly in physical and mental problems that cannot be cured effectively without addressing their underlying causes. The root of all medical problems may be traced to life skills and life attitudes, and true healing may only be possible when the individual knows the underlying causes to ill health, and how to address these. Failing to gain and apply this knowledge may lead to unnecessary expense, discomfort and misery. Adhering to the laws of nature and aligning to the natural flow of energy is the most effective and satisfactory way of attaining health, personal empowerment, transformation and grace. make possible effective body movement and sound integration of body structure and functioning. Awareness and mastery of these principles are more important than fitness or performance alone, and form the basis of the integrated, whole-body exercise techniques of yoga. Good posture, effective breathing and mobility have obvious advantages to all physical activity ranging from ordinary movement to extreme sports. Good posture improves appearances; an upright person conveys bodily confidence, and appears more attractive and younger. Yoga exercises has a stimulating, cleansing and massaging effect on the internal systems that ensures outer beauty, clear and radiant skin and vitality through inner cleanliness. Yogic stress release, relaxation and rejuvenation, power of mind techniques and meditation are all connected to effective breathing and postural body awareness. Stress release and coping with stress is one of the greatest contributions of yogic well-being. Recognizing poor posture and inadequate breathing as a major cause of stress can go a long way towards preventing the accumulation of the high levels of stress one is constantly exposed to by just being alive. Improved posture and breathing can assist overcoming mental or emotional distress, and establish comfort and well-being. and a positive attitude to life, contribute as much to well-being as its exercises does. Well-being requires that the body and all its systems, especially the brain and nervous system, are not taxed by excessive stress, or hampered by poor nutrition and toxicity. Although stress release is entirely possible without acquiring meditation skills, meditation assists in the training and focus of the mind, and in combination with calm-inducing breathing, helps to make relaxation possible under any circumstance. Meditation improves the ability to see, set and achieve clear goals because the thought and dream worlds precede the physical, and are improved by visualization and a creative mindset. The focus of meditation promotes conscious power of mind over body, improving stress release, relaxation and rejuvenation, enhancing emotional well-being and general healing. The principles of the Five Keys, as with all yoga, should be individualized to suit the needs of the practitioner. They may be learned and practiced anywhere, any time, without equipment, at any opportunity, at home, at the workplace, in ordinary clothes. The principles of yoga, and its teachings of health care are universal, and equally applicable to the casual and professional sports person. The nurturing nature of yoga lends itself to effective preventative health care for the healthy, but its inherent healing nature is also curative. 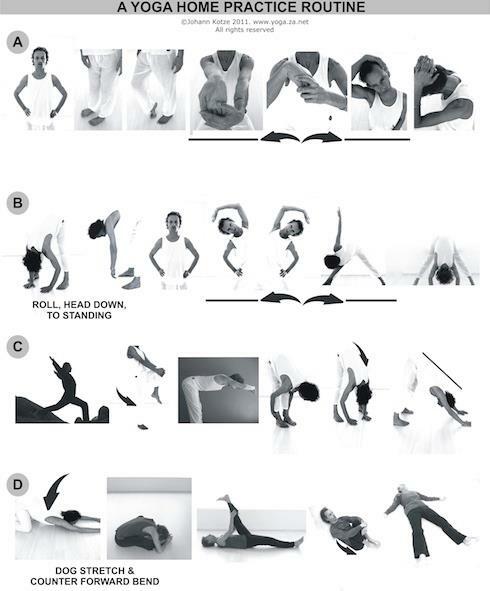 The beginner and advanced yoga practitioner of any style can benefit from the root yoga principles of the Five Keys. Advanced yoga practitioners, or those with an interest in spiritual practices alone, may benefit from the body-mind-spirit insights afforded by the Five Keys. Yoga can be very gentle, and many important facets of the Five Keys are accessible to the not-so-fit, the ill and disabled. Corrective or remedial yoga is based on exercises specially adapted to heal and empower. The three physical Keys of posture, breathing and mobility underlie all the principles of the Five Keys to well-being. Yoga body-awareness conveys the understanding that strenuous exercise with poor posture is dangerous, and teaches that even walking or sitting with a poor posture is hazardous to health. Any physical performance or motion is greatly enhanced when the body is properly aligned, and in harmony with effective breathing. Postural integrity protects the spine, all joints and muscles from excessive strain or tension. Longevity of all moving body parts that endure strain when subjected to poor postural alignment, are improved. Proper breathing protects the heart and respiratory system from being overworked. This brings a high degree of safety and protection from injury to all types of exercise. Good posture, effective breathing and mobility are essential to people of all ages seeking youthfulness. Youthfulness in this sense of the Five Keys is measured as health and vitality, and the ability to achieve satisfactory levels of physical and mental performance, regardless of age. Such youthfulness increases the chances of achieving and maintaining personal happiness and high quality of life throughout life. Health and vitality do not belong exclusively to the young, and youth guarantees neither – it earned. 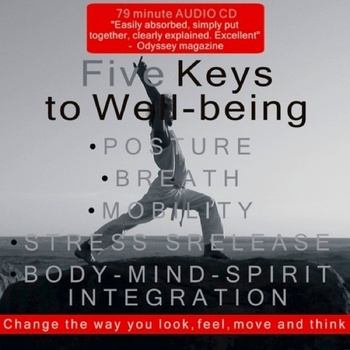 The FIve Keys to Well-being promotes health and vitality by improved functionality of all the bodily systems. All its exercises are aimed at cleansing the system of toxins, rejuvenating, purifying and oxygenating the blood stream and the total organism by supplying bountiful energy to every cell. This inner health is then reflected outwardly as visible vitality that take years off any appearance. Age is inconsequential where radiant health is present, when it is not judged not by wrinkles or grayness of hair, but by the absence of a dull complexion, by mental sharpness and clarity, physical strength, spring-loaded flexibility and an uprightness and confidence as opposed to being jaded, and shuffling, lacklustre movement with a stooped posture. Stress wreaks havoc with health and vitality, and adds years of wear and tear to its victims physiology and outer appearance. A relaxed manner, supported by a holistic lifestyle with a positive attitude to life, has a beneficial impact on physical and emotional well-being that, when enhanced by the contentedness of meditative insight, also translates as youthfulness – in appearance (a relaxed, at ease person looks better than a worried person) and mentally (an emotionally and spiritually satisfied person is healthier, therefore more vital, than an unhappy person). Meditation further supports a sensitive connection to the spirit of life or the life force of nature and the universe, and a balanced view of life. Being so in touch with the rhythms of life brings about inner peace, a serene, graceful radiance at any age. Measure your success in implementing the Five Keys to Well-being by comparing how much better you feel and look when you adhere to its principles, and not by comparison to others – health is not a constant, equally distributed statistic, but a value relative to yourself. The degree to which you as an individual has strength, mobility, endurance and so forth cannot be measured on a scale or point system, as there is no objective criteria of ideal health to measure against. Well-being does not depend on your athletic aptitude, mental predisposition and other abilities or talents – it is influenced by your maintenance of it in relation to your constitutional disposition, illnesses, disabilities, lifestyle etc. Health is never a competition, and your responsibility for it only extends to yourself. Some individuals are more mobile than others, or have strong constitutions that can handle high levels of abuse. Do no compare your ability to do the exercises or take punishment from long work hours, for example, to those of others. A compromised person, taking better care of their health than a healthy person neglecting theirs, achieves a higher level of relative health than the one with the abundant natural gifts. A person with a respiratory problem or back injury may be able to breathe or move more effectively in relation to their disadvantage than a healthy person who does not adhere to the principles of The Keys, despite their potential advantage. On such a relative scale the healthy, well endowed person is worse off in relation to his or her potential than the handicapped individual, even though the advantaged individual may still out-perform the compromised person. Some rare individuals get away with taking little care of their health and still mange to appear graceful because of an inbred or culturally induced good posture and genetic make-up. Yet even these, when failing to pay attention to nutrition, regular exercise and the other principles of well-being, are most likely to lose their advantage with age. Health should be a personal quest of realizing your own potential. ● Am I comfortable in my body? ● Do I perform to my optimal physical ability? ● Can I sustain my level of work and recreation without compromising my health? ● Do I think clearly, and can I sustain my concentration over a long period of time? ● How do I feel when I wake up? And at the end of the day? ● Am I realizing my dreams in real life? ● Do I get ill often?